Hello Jim. Yes, here's what's going on. Virtually all lawn grasses in this part of the country are cool season plants. What that means is that grass flourishes in the spring and fall when the days and nights are cool and the rain is plentiful. Cool season grasses go dormant and turn brown in the summer when the temperatures rise and the rainfall diminishes. That's nothing to get alarmed about; it's just Mother Nature at work. Weeds are just the opposite, they are warm season plants that grow strongly in the heat of the summer and diminish in the fall. The strong grass growth in the spring and fall helps to crowd out weeds. When you have a lawn irrigation system, it "tricks" Mother Nature by keeping grass growing right through the summer and not letting it go dormant. In your case, this year was different. 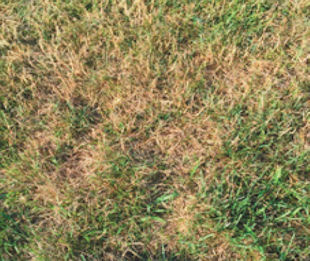 Since your irrigation system didn't get going until several weeks ago (and we are in the throes of a pretty significant drought) your lawn started going dormant and the weeds began to flourish. Unfortunately, once that happens, it's virtually impossible to reverse. Keep watering and know that in September things will be back to normal and your lawn will look great, but for now you'll have to grin and bear it. Speaking of September, whether you have an irrigation system or not, your lawn will never look better than it does in the month of September. If you don't like the way your lawn looks in September or were not happy with the amount of weeds you had in 2016, September is the month to take action and get your weed control for 2017 started. Strong, healthy lawns with dense grass crowd out and shade weeds so they will be minimized next year. Strong lawns start with proper soil chemistry and good microbial activity. Sprigs & Twigs is particularly proud to have ten staff members who are Accredited Organic Lawn Care Professionals by NOFA (Northeast Organic Farming Association) which means they have been trained, passed rigorous testing and understand organic lawn care and turf management practices. We have more accredited NOFA professionals than any other company in the country. We do not use unnecessary and harmful products like "Weed-and-Feed" or chemical fertilizers. If we can be of service, give us a call.